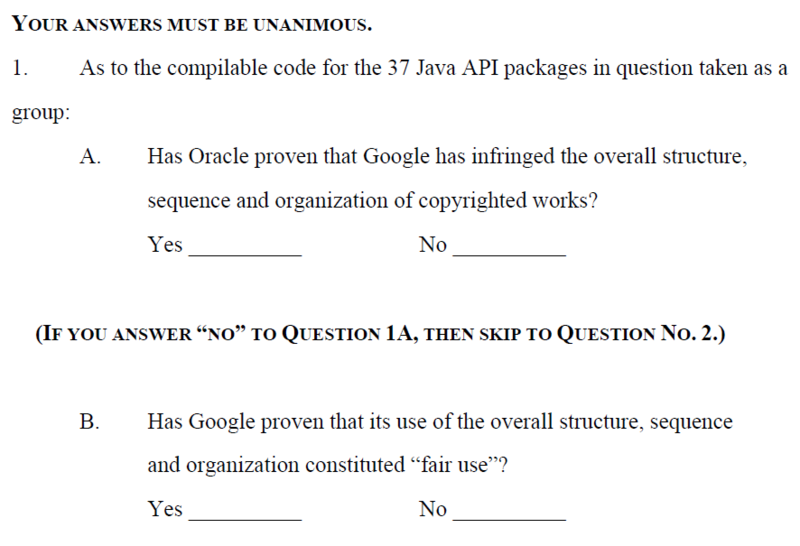 If you know anything about copyrights (and if you're on the internet a lot, you probably do know more than most people), you know that part two of question one asks the jurors something very important: was Google's use of Oracle's Java APIs fair? The most important factor in assessing the "fair use" defense has been described by the US Supreme Court as number four - the potential effect on the value of the copyrighted work caused by the infringing use. Google argued that its use of the Java APIs constituted something that actually increased the value of Java as a whole, by increasing interest in Java among developers (which it unarguably has). Oracle argues that it demolished the company's plans to leverage Java in the mobile space and beyond, and irreversibly "fractured" the Java community - and that claim isn't necessarily without merit (though the notion that Java would have "taken off" in mobile without Android like it has is quite laughable). Google also argued that the company's use of those APIs was fair under the doctrine because it was so transformative (a part of the "purpose and character of use" factor) that integrating them into Android basically constituted a sort of "raw material" for a completely new, radically different creation - not simply as something "slapped on" to an existing product. Something non-transformative, for example, would be taking copyrighted songs and splicing the melodies and transcribing the lyrics onto a karaoke machine (the alleged "transformation"). Clearly, Google's use goes a bit further than that. Google stated that the source code in Android for these APIs is not even (strictly speaking) copied from any Java IP. But one niggle in that statement is the fact that some of that code came from Apache Harmony, open-source software that Oracle contends did not come without strings attached when used as Google did, and that Oracle had an interest in those APIs. The jury apparently agreed with Oracle here in its finding of infringement. But the transformation (or market value) fair use arguments caused a deadlock - the jury was unable to reach a unanimous decision. On this basis, Google has moved for a mistrial, and will probably get it. 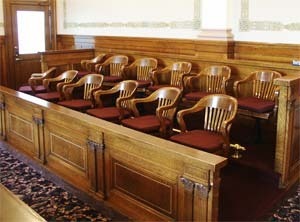 The jury instructions clearly state that the jury must reach a unanimous decision on the individual questions (meaning both sub-parts must be unanimous), and they failed to. The reason the answers must be unanimous is because Google argued in its proposed instructions that infringement and fair use are inseparable, "two sides of the same coin," and that the jury should not be allowed to decide one without deciding the other. This also makes sense, given that fair use is a fact-based affirmative defense, and often serves as the lynchpin issue in high-tech copyright cases. If the jury cannot be made to amend their verdict (the judge can order further deliberation, but this seems unlikely given the need to move on to the next phase of the trial), Google's mistrial motion will most likely succeed, meaning the copyright portion of the case will need to be retried at a later date with a new jury. Of course, this all is ignoring the fact that big, big questions about the copyright portion of the case remain - all of them questions that could basically get Google out of the fire. 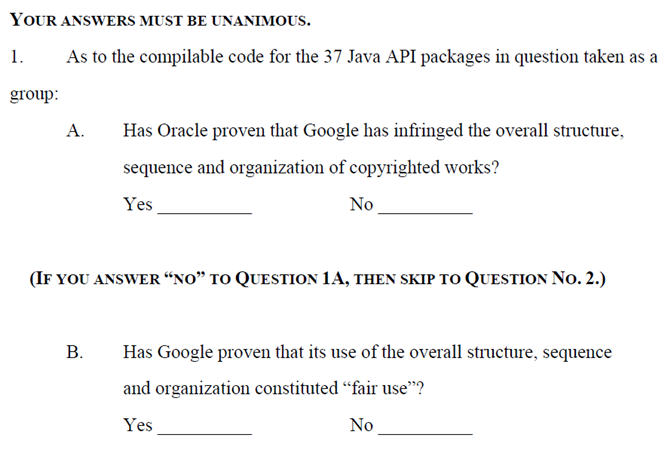 The biggest among them is one the presiding judge will decide: whether or not Oracle's Java APIs are actually under the scope of copyrightability. The reason the judge is deciding this question is because it is not one of fact, but of law - the judge must interpret copyright law and determine whether or not Oracle's asserted IP is actually IP at all. Next, Google has a litany of equitable defenses (doctrine of laches, copyright misuse, waiver, unclean hands, etc.) it can assert against Oracle, most of them essentially saying "you should have done this much earlier" or "you sat on this knowing it would only get worse for us the longer you waited." Such defenses rarely pan out, but given Oracle's growing unpopularity for its increasing litigiousness, who knows, they may resonate with the jurors. The takeaway today? Not much, other than the fact that Oracle made a good case for infringement, and Google a decent one for fair use - because we're probably going to have to do it all again with a different jury. And the judge's decision on copyrightability of the APIs could render much of the copyright portion of the case moot later on, anyway.